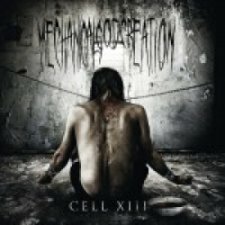 The Italian band Mechanical God Creation plays some straight forward death metal on Cell XIII. However the band seems to get some inspiration from the gothic genre as well. Apart from that the Italian five-piece doesn't tread on untried territory. The music relies a lot on thick grooves and slammy parts. The Italians also add some fast parts here and there, and that works well. However the music rarely gets exciting, but the band do have enough good riffs and parts for it not to bore. The vocals are standard death metal type of vocals. It doesn't change anything that it's a woman singing. As I've already written the music is diverse. Despite of this I have difficulties telling the songs apart. I miss something in the music, but I can't put some exact words on it. I like the thick production as it provides the music with a nice texture. It works well and also helps emphasize the dark and gothic inputs in the music. Cell XIII is not bad, but it's not an overly exciting effort either. It has its interesting parts, but as a whole it has trouble staying exciting.